You know when you’ve seen something before, but can’t quite place when or where? 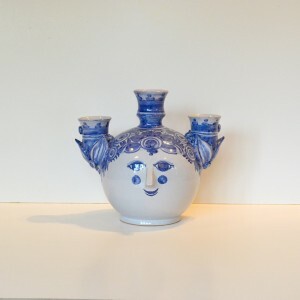 Last week I was confronted with a superb collection of Danish ceramics designed by Bjørn Wiinblad and exactly this happened. Then I remembered being enchanted as a child by some plates and plaques bought back from Denmark by some well-travelled friends of my parents. What I loved were the cheerful illustrations of friendly, almost cartoon-like characters. This style isn’t really surprising when you learn that one of Wiinblad’s most prolific roles was as an illustrator, notably for a Danish daily newspaper Nationaltidende, but also for a number of storybooks and posters. He didn’t just stop here – whole books could be written about his career, which has encompassed designs in glass, silver, textiles and even for theatrical productions. However, we only have limited space, so let’s just concentrate on his ceramics that first captured my imagination. Instantly recognisable, his style is very modern and personal with almost naively drawn, but immensely charming, characters, usually with happy round faces. His playful designs are imbued with a sense of fantasy, joy and happiness as can be seen in his most used themes, which include nature, music, folk art, fairytales and lovers. His designs also often tell a story, frequently historic, from everyday human experience to religion and the stuff of myth and legend. One of the great things is that if you like his style, you will find something that you can afford whatever your budget. The first point to consider when looking at Wiinblad’s designs is who made the piece, followed by the colour, complexity and size. One of his first associations was with the Danish factory Nymolle. He began working with them early in 1946 and ended up running the factory from 1976, when it faced closure, until the 1990s when it finally closed. Nymolle production tends to be decorated with single colour transfers in black, light blue or red, usually on a white background. Pieces were produced in large numbers and as such can easily be found at affordable prices today. His calendar plaques are amongst the most commonly seen objects and tell the story of a young, courting couple through the 12 months from their meeting in January until they have a baby in December. Produced by Nymolle from the 1950s until the 1990s, they make an excellent ‘way in’ to Wiinblad’s work. They are found in red or black on white and the more desirable and valuable gold on black. Brilliantly affordable and satisfying to build up slowly as a set, a single wall plaque can usually be found for around £3-6 for the red/black and white versions and double that for the gold and black versions. For those of you who like to put their collectables to good use, the same designs can also be found on mugs, usually being priced at about £10 each. Slightly more valuable at around £30-50 are his highly decorative ‘Four Seasons’ plates, each of which each represent a different season. Available in a range of sizes, they have a very complex design. To me, they shout his very unique style the best in this area, especially the large 14in examples. Even something more complicated such as a wall mounted candle sconce (used to shed light on your growing collection, of course) will still leave you with ample change from £100. Once you’ve fully explored his work at Nymolle, the next ‘level up’ are his designs produced by Rosenthal. As you’d imagine from one of Germany’s best-known names in ceramics, their pieces tend to be finely made with more numerous and brighter colours highlighted with handpainting. Their series of Christmas plates are extremely popular, and were released annually at Christmas, each with a different festive scene, often from the Nativity. In general values vary from under £100 to over £500, depending primarily on the age of the piece. As with most of Wiinblad’s designs, earlier examples from the 1970s are the most sought after. 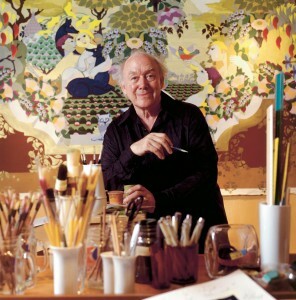 In a similar vein, he also designed brilliantly coloured plates and vases that illustrate fairytale stories such as ‘Sinbad’, ‘Aladdin’ and ‘1001 Nights’ – one of his most popular patterns. Whilst Aladdin plates can generally be found for under £50, ‘1001 Nights’ vases can fetch in excess of £100-200, depending on size and shape. At the top of the tree are the pottery pieces produced in his personal studio that currently start at £200-300 upwards. 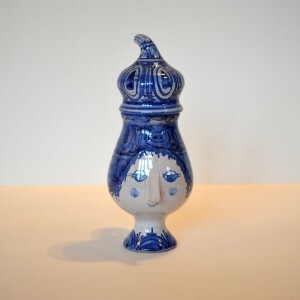 All cheerfully hand-painted, they take his muchloved graphic designs into three dimensions, ranging from elegant ladies to fanciful figures or heads that act as candlesticks or bowls. Only a small number of people work in the studio at any one time, so examples are rarer than those produced by Nymolle or Rosenthal. Many designs are still made today, but as before it’s pieces from the 1970s that are the most popular and valuable. They also tend to be more colourful with single colours, usually blue, dominating in later decades. Size matters too – the larger the better and more valuable. The hand-signed base will give you additional information. Looking at the base illustrated above, the ‘BW’ monogram tells me that it was made at his studio, the ‘70’ that it was made in 1970, and the ‘L13’ is the model number. Don’t fall into the trap of thinking that the BW monogram means that the great man made it himself. This is not the case, but a hot tip is to look out for those that were made by him – identified by a small painted ‘character’ face motif on the base. More modern pieces by him may not bear this motif, but should be identified in some other way. Since Wiinblad’s death in 2006, interest in his work has grown, with many of his designs still being made for a growing band of dedicated collectors. Appreciation is truly global, but is particularly strong in Denmark and the US, where he once had a studio and has exhibited regularly. Due to this and his success in so many fields of design I think his pieces, particularly the Studio range, still have long way to go. If you’re a fan of Danish design, now may be the time invest in what is sure to become a 20th century classic. I guess I’d better tell my parent’s friends! Wiinblad’s hand-painted pottery studio pieces are the most desirable and valuable, but look for his designs produced by Rosenthal and Nymolle – in that order of desirability. 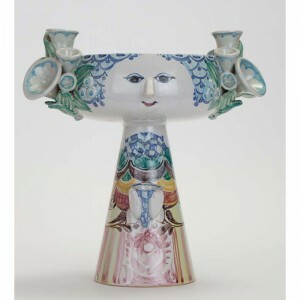 Regardless of the maker, look for pieces produced in the 1970s, preferably with many bright colours. Larger, more complex pieces will fetch a premium as will those from his most famous Rosenthal ranges. Damage on mass-produced pieces reduces value considerably, but always examine edges and protruding parts of Studio pieces for damage and repair as this too reduces value.